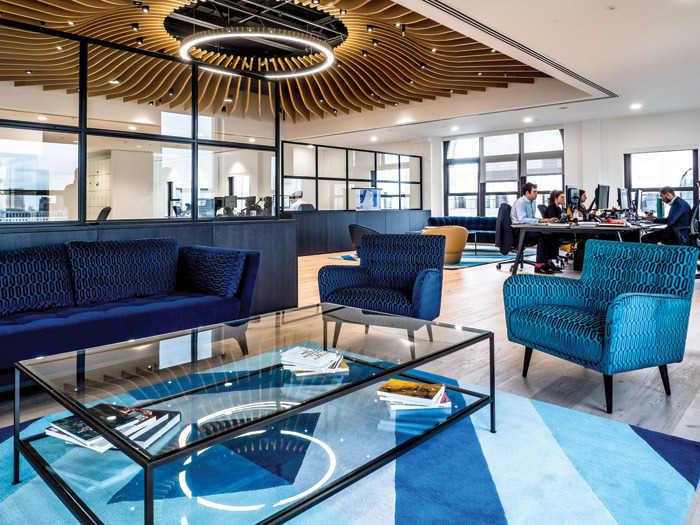 For a global leader in strategic communications, a new London HQ for company Finsbury would need to reflect its vision and core values, while also creating a hub for clients and staff. Finsbury found its new home in the newly refurbished modernist icon, the new Adelphi building. Once the site of 24 unified terraced residences, designed in the 1770s by the Adam brothers, it was an exemplar of city planning of the time. Then came the Victorians and their architectural ambitions; facades were altered beyond recognition and the area lost its unified aesthetic. The Adams’ buildings were largely demolished in the 1930s to make way for the new Adelphi – just as iconic, just as grand, but this time a monumental art-deco structure. The new Adelphi became a much-loved segment of the north bank of the river, overlooking Embankment Gardens. Following a sensitive redevelopment by Aukett Swanke, the building has now been brought up to modern standards, making its premises as sought-after as its location so that the heritage asset can continue to be desirable and functional. This new HQ for Finsbury allows the company to make just as bold a statement with its premises and location as it does in its strategic messaging. BDG architecture + design provided support to Finsbury from the concept to moving in, with help during lease negotiations. Going on to provide workplace strategy services for the relocation, BDG also delved into understanding the teams’ working style so that the design of their new workplace worked with and for them. Most striking about the design is the vast ceiling centrepiece in the entrance space. 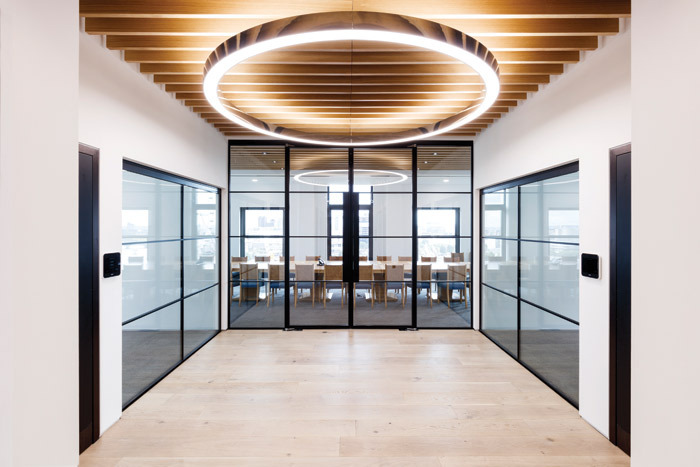 The undulating solid wood feature illuminates the space with a large circular light fitting and provides a focal point for the office. The recessed wooden elements fan out from the sunken ring light, with spotlights spaced equally between them. 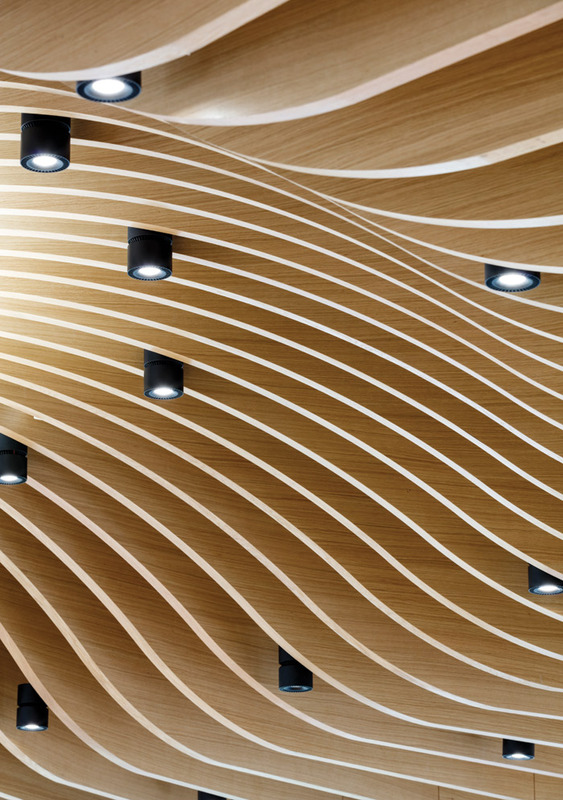 The 7m x 9m timber ceiling also provides acoustic comfort within the entrance’s double-height, column-free space, composed of refined details and craftsmanship. This form and materiality is subtly repeated in other areas to form a fluid, cohesive design and create visually arresting spaces but with a delicate material palette. Above the kitchen space the timber fins are recessed into the ceiling to create a sense of spatial separation and provide more acoustic insulation. Elsewhere BDG has employed a clean, black and white palette, highlighted with greenery and feature pieces of furniture, including Perception sofas designed by Philippe Boux and Sofia armchairs by the Roche Bobois Studio. This collection of furniture in blue shades and tones temporarily breaks from the strict monochrome palette to demarcate a staff breakout space. BDG has created spatial divisions with blackframed glass screens that echo the solid lines of the Adelphi’s window frames and sit on a storage system. They complement the original art deco features of the building in a more modern and useful setting. Not reaching the full height of the ceiling, they provide division within a large office while still allowing air and light to flow freely through the spaces. In addition to aesthetic details BDG has also created a variety of private, open, and quiet meeting spaces, all with a spectacular view of Westminster or the City, proving that interior interventions in iconic buildings such as the Adelphi can be bold and brand specific yet still be carried out in a sensitive responsive manner. Its scheme allows the existing architecture to breath and has celebrated it with minimalist, meticulously detailed additions.